Our approach to services begins and ends with our BRISE Model. We use this holistic approach to help you attain your business objectives and meet your financial goals. We go beyond looking at what you have done and where you are now. We look ahead to where you want to be and how to get there. 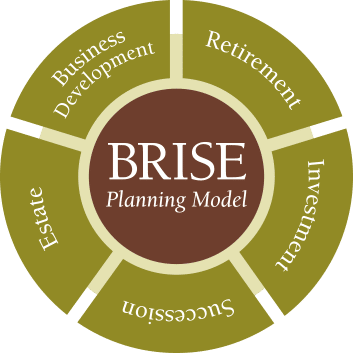 There are five main aspects of the BRISE Model, including business development planning, retirement planning, investment planning, succession planning, and estate planning. We offer you customization and flexibility to choose the services you need to help build and maintain your net worth. For many privately-owned business owners, their company often makes up the largest piece of their net worth. With this in mind, we offer business development services as a key component of the BRISE model to improve areas of your business and enhance its profitability and value. We will not only identify strengths and weaknesses of your business but create a plan to enhance or improve them. We understand your need to plan for a financially-secure retirement and maintain your current lifestyle even in the future. We offer retirement planning as a core component of our BRISE Model and work with you to assess your current financial situation and project your retirement needs. We formulate an action plan to increase the value of your assets while ensuring you have the financial resources you need in the most crucial time. By regularly monitoring your investments’ performance, you can make timely decisions to correct under-performing assets and determine proper asset allocation. 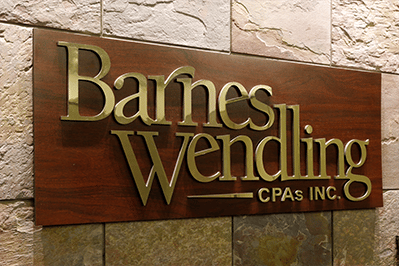 At Barnes Wendling CPAs, we offer investment planning services as one component of our BRISE model to improve your investment performance and increase asset value. We will work with you to help develop a strategy for each investment and identify when parameters and goals aren’t being met. The successful transition of your business can help the next generation overcome the low survival rates of second generation, privately-held businesses. To help you with this complex and sensitive process, we offer succession planning services as an important piece of our BRISE model. We work with you to establish a plan for continued prosperity and the successful transition of your business to increase its value and maximize the return on your investment. Proper planning ensures your estate will pass to the individuals or charities you desire in a manner and time frame you select. To help you maximize the assets passed to your heirs, Barnes Wendling CPAs offers estate planning services as a vital competent of our BRISE Model. Our estate planning process involves the review of lifetime planning considerations through the use of gifts, trusts, or methods of ownership.